A “Naked Truth” about Technologies in Schools? In a recent post I predicted that by 2020 a great many teachers and students would be using hand-held devices for downloaded textbooks, versions of Twitter for instant communication, and that online learning, while growing, would still be peripheral to mainstream public schools. I did not even mention 1:1 laptops. A reader thought my analysis and predictions were off-base, particularly over the absence of 1:1 laptops and directed me to an article that she believed more accurately portrayed the situation while offering a vision of the ways that schools should use technological devices. In “The End of Techno-Critique: The Naked Truth about 1:1 Laptop Initiatives and Educational Change,” Mark Weston and Alan Bain summarize the evidence and arguments of those who have questioned 1:1 laptops. Weston and Bain profile my writings as representative of the “Techno-Critique.” Except for a few critical points, I found their summary of my articles and books fair. Furthermore, their review of the evidence of laptop use and effects in Maine and Texas is far more damning than anything I have written. The authors then situate 1:1 laptops within the larger context of innovation and conclude that most efforts at “educational change, innovation, and reform” (p.7)—including laptops—has had “little or no sustained and scaled effects on teaching, learning, and achievement” (p.8). Why such a dismal record for 1:1 laptops? Weston and Bain acknowledge that inept implementation of innovations may account for failures. But that is not their target. “A more likely cause,” they argue, “is the autonomous, idiosyncratic, non-collaborative and non-differentiated teaching practices that largely remain uninformed by research about what it takes to significantly improve student learning and achievement” (p. 8). If these uncoordinated and varied teaching practices untouched by research is the problem, what solution should policymakers and practitioners, eager to achieve “scalable and sustainable change,” grasp? It is here that Weston and Bain invoke 1:1 laptops as a precursor for the kind of change they seek. Even though they point out that laptop programs have failed to achieve their goals, they have created a “potential foothold for change” (p.9). Their vision is that laptops are “cognitive tools that shape and extend human capabilities” (p.10). They are tools that are now so thoroughly integrated into daily professional activities—a surgeon using an arthoscope to trim cartilage, a civil engineer using computer-assisted design to figure out metal and concrete stresses in a bridge—that future use by students and teachers will become second-nature (p.10). 2. School community “deliberately and systematically uses its simple rules” to design and implement school tasks and actions. 4. Real-time feedback from all community members “drives bottom-up change,” and makes each member accountable. 5. The interaction of rules, design, collaboration, and feedback lead to a shared conceptual framework for daily classroom and school activities that is self-organized and ever changing. 6. This self-organized, dynamic community “demand(s) systemic and ubiquitous use of technology” (p.13) to use “cognitive tools” everyday in classroom practice. Soaring to rhetorical heights, this rosy picture of community solidarity in designing and implementing schools where 1:1 laptops can now—as never before–effortlessly and quietly transform teaching and learning is startling in its denial of history and context.I found no mention of the frequent ideological wars over the best ways of teaching and learning and the constant political struggles over dollars, staff, and buildings–all of which have shaped the course of school reform in the past century and a half. Nary a word about severe inequities in teaching and learning in big city schools. Even worse, feature 6 where the community stipulates that technology has to be used in classrooms daily ignores all of the prior conflicts over innovative devices and assumes that even with community agreement, desired student outcomes will be achieved. Had the authors identified private and public schools over the past decades that have had these six features and used technology to transform children and adults, their argument would have been stronger. Absent the naming of such schools that have sustained and scaled up change to districts and states, and without any sense of frequent political conflicts over choice, competition, entrepreneurial innovations, and the low return on investment that instructional technology has accumulated over the past quarter-century, I found the authors’ analysis of the problem of 1:1 laptops far superior to their blue-sky scenario for creating school communities that “demand” use of technologies as cognitive tools to completely overhaul teaching and learning. I have just discovered your blog – which is outstanding. Enclosed is a draft blog I drafted after reading this article – would welcome any feedback. “Larry Cuban’s excellent post attacking the belief that technology in general, or 1:1 initiatives in particular, will magically transform schools and learning is outstanding — which is why I reprinted it in it entirety in my last post. However, I believe his dismissal of the Weston and Bain vision summarized below is only 1/2 right. The part he has right of course — is that this sort of community does not demand systemic use of technology — and there is no evidence that systemic use of technology by itself produces this type of community. However, based on 30 years of experience of leadership in public, private, and non-profit organizations — and extensive study of management and organizational literature — I believe organizations that build a culture that follows those first five rules — can in fact produce outstanding results. Those rules are a variation of Demming classic Total Quality Management principals — which I have found can be simplified and adapted to almost any organizational setting effectively. Thus, Weston and Bain prescription for effective organization is accurate in many ways — and most effective organizations today do heavily use technology to streamline their operations and maximize use of human resources. However, Cuban’s critique that this is not a result of 1:1 initiatives is spot on — and further – his larger critique of attempts to find cookie cutter school reform formulas is also accurate. Applying the Weston and Bain prescription for effective schools (or any type of organization) is by its very nature a unique, organic, dynamic and unpredicable process. The essence of TQM is clarity of goals, rigorous data collection, then actions to improve performance based on the analysis of that data — actions which cannot be predicted in advance. In sum, Cuban’s larger point that school improvement is hard — as is improvement in any organization – is true. And at its core it is not about technology – technological tools are used to make the organization more effective – but it is the organization’s skill at defining a shared vision, communicating, collaborating, evaluating, changing, etc. that is the driver of effective outcomes. In work experiences at the classroom, school district and state department of education levels, I have found that, yes, school improvement work is challenging and requires a commitment to hardwork over time. As Weston and Bain have indicated, it is through the development of a common/shared language for all stakeholder, to include students, that fosters adoption in minute by minute practices that define the glass that we pour our work. Technology is critical in the ability to provide all stakeholders feedback opportunities and regular review of core organizational transactions that inform and guide the work. Hello Larry: Thanks for your thoughtful consideration of our recent article “The End of Techno-Critique: The Naked Truth about 1:1 Laptop Initiatives and Educational Change” published in JTLA. We want to respond to your critique of the article and specifically your remarks about the tenets or principles described in the latter part of the piece. The six principles described in the article were the product of a 12-year theory- to-practice project that developed and tested an application of self-organization theory in a school setting. While we agree that many of the claims about what should or did happen in school reforms reside in the realm of the rhetorical, this was not the case in the self-organizing school project which generated over 15,000 pieces of qualitative and quantitative data over five years including 1600 classroom observations and 12,000 student evaluations of teachers in a five year longitudinal evaluation. An eight year study of achievement produced achievement effects of .58 and .70 (for students with learning disabilities) while studies of the use of ICT showed positive effects on teaching practice and student achievement. A five-year longitudinal study of team process and faculty collaboration that compared faculty perspectives in the SOS project school with 42 other schools showed that faculty felt their work environment was more collaborative, and they spent more time engaged in constructive collaborative problem-solving activity. 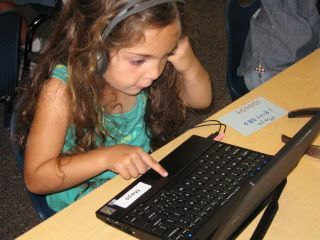 The SOS project school developed and implemented a 1:1 program beginning in 1992. For the most part, the data described above were gathered as part of the ongoing conduct of the school and used for problem-solving the design and process, the professional growth of faculty, evaluating student progress, and reflecting on school performance, as well as developing connections between the fidelity of implementation and the outcomes of the project. We contend, based on an extensive review of evaluations of CSR and other reforms, that the SOS project, with its duly acknowledged limitations, stands in contrast to the weak process evaluation of reforms (Berends et al., 2001) and the consequent difficulty attributing effects to their designs and process. We also recognize that given the brief of the journal and the topic of the special issue, we did not treat the case for the principles extensively in the ‘techno-critique” piece. That said, we did cite the major source for the principles described in the article which are described in “The Self-Organizing School: Next Generation Comprehensive School Reform.” This book provides a more detailed account of the theory and practice and summarizes the evaluation studies along with their sources in the peer reviewed and professional literature. The book also describes the many honest challenges of creating such a school and details the methods employed and the practical and methodological limitations of the work. We share this information with you to address the claim that the principles described in the “techno-critique piece” are “rhetorical and rosy” or were developed without due consideration of the current state of reform. Two chapters of the book are devoted to contemporary issues including the challenge of scaling up. With respect to this point we believe that most reforms have rushed to scale in an incomplete state without the kind of full development required to be successful in any single school. There is a strong body of evidence in the CSR literature in support of this assertion. It should come as no surprise that those many reforms would bump into the issues you describe regarding best practice, the use of technology, inequality, and the deployment of resources. As such, we feel confident that the principles described in the “techno-critique” article are in fact the antithesis of ‘blue sky’ and represent one of the most documented and disciplined effort to understand the theory, process and outcomes of a reform, albeit in one school. We contend that given the difficulties experienced by prematurely scaled larger efforts, a strong argument exists for building more complete approaches and robust process at a smaller scale in individual schools prior to scaling to many schools and systems. This is especially the case with respect to the way reforms consider and address the professional lives of teachers. The SOS project represents just one example of the role of theory as a design metaphor for reform and signals the importance of smaller more complete research practitioner efforts. We believe there should be many. I read the comments and the original articles here with great interest. My own research around the individual characteristics and experiences of teachers involved in computer integration (Mueller, Wood, Willoughby, DeYoung, Ross, & Specht, 2008) suggests that it may not be the technology itself that has an impact on student learning but rather the fact that teachers who are willing to integrate technology are using innovative practice, gathering data, and evaluating practice to improve student learning—one by one, teacher by teacher. As Tyack and Cuban (1995) suggest (as cited by Westin & Bain, 2010), ineffective school reforms have been “done to it, not by it”. Individual student success and effective integration of new cognitive tools may be a result of effective practice and teacher initiative rather than system-wide technology “projects”. As so many of you have mentioned, the technology is merely a “cognitive tool”—emphasis on the ‘cognitive’—that supports an explicit consideration of how students learn. Planning to use this technology can demand that teachers understand the complex processes and higher order thinking that is necessary in realizing the potential of this “cognitive tool.” Teachers who are successful at integrating technology also have and/or develop content and pedagogical knowledge (TPACK, Koehler & Mishra, 2009). It is this integrated body of knowledge and skills within an authentic learning context that results in effective instruction and positive student outcomes. Perhaps the journey to this integration is the secret to success. I appreciate the wisdom and professional discussion so readily available as a result of this blogging technology. Some may argue that there are in excess of 50,000 apps available for the iPod. Those who have the time to go through all 50,000 apps to find the true gems while I am trying to put together engaging lesson plans, please contact me through this blog. The other equally unfortunate response is that teachers should create their own content. For me, that’s like telling the woodworker that he should grow his own trees. By the time I have a full year’s worth of content created that incorporates the technology, either the content or the technology has changed. Often, that means starting unit planning all over again. As it is, how many times have one of us found a wonderful web site, only to have it disappear the next year. One more issue that adds an extra degree of challenge to teaching, and that which led me to this post, is the companies that make filtering software that school districts employ to keep their students (and teachers) safe. In my experience, web sites are filtered with a chainsaw rather than a scalpel. That is, excellent web sites that foster creative thinking, problem solving, and higher level thinking skills are blocked because their content is considered a “game.” I don’t see any communication between the end users of the filtering software (students and teachers), and those who profit from it. Too often, districts use this software as a babysitting tool to keep students and teachers from wasting tax-payer dollars. Sadly, the teachers who know their students, know how they learn best, and can differentiate based on real needs rather than textbook theories of differentiation are kept out of the conversation. In my opinion this is not simple, nor have I ever seen any teacher change the way he or she teaches based on a rule such as the one above. These are the types of rules that make bureaucrats happy, but don’t do much to help teachers or students. Unfortunately, it’s usually the bureaucrats that are in charge when these rules are written, so the rules end up sounding like, well, bureaucrats. Once the classroom doors are shut, teachers usually fall back on how they’ve been doing things for years. Unfortunately, those teachers who are most against change, are the ones who are most in need of it. This is great in theory, but as soon as “all members of (a) community” start encroaching on the territory so closely guarded by a school district’s administration, then all bets are off. Too many administrators that I’ve seen are too possessive about their area of expertise. They were in the classroom twenty years ago, so they know what’s best for the classroom of today. From my experience, accountability stops at the classroom door. Do you know of a school district administrator who’s held accountable? I don’t. Teachers, yes. Principals, sometimes. Administrators, no. This sounds terrific. I know my classroom is ever changing – I have been working on some ideas this summer that should be really exciting for my students. Unfortunately, I also know a few teacher at my school, and at other schools where I’ve taught, who teach the same lessons in the same way, year after year. Sadly, we both know they will never change, and there are teachers just like them in every school across the country. Their students do well on standardized test, but that is as far as their learning goes. I refer to my original point: Without high quality content, technology is just a chisel in search of some wood. There are many concepts that I know could be enhanced by technology, but despite searching off and on for years, I often cannot find what I need at the quality I expect.